Tree Alexander and his partner Carlton pictured with three of his four children. And rebuilt his life along the way. Tree Alexander says he comes face to face with gratitude every morning when his soap shop Zambo Aroma (ZamboLLC.com) opens for business. 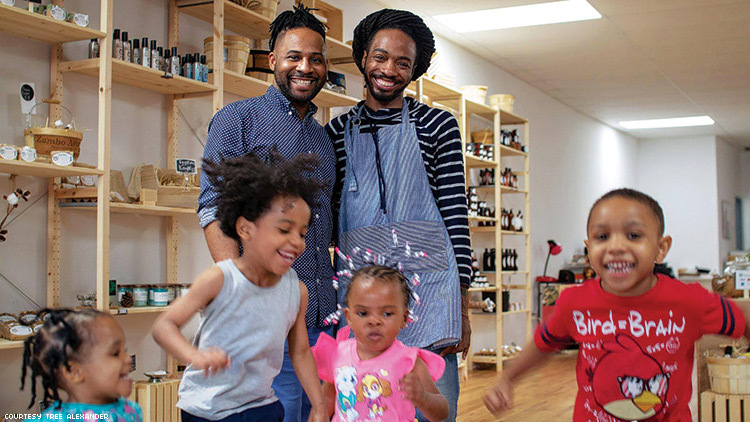 The 31-year-old activist and entrepreneur founded the Bronx, New York-based store not only to provide skincare products, but as a place to offer self-care, self-nurture, and self-respect for others. All this coming from a guy who was once experiencing homelessness on the subway platforms of New York City. 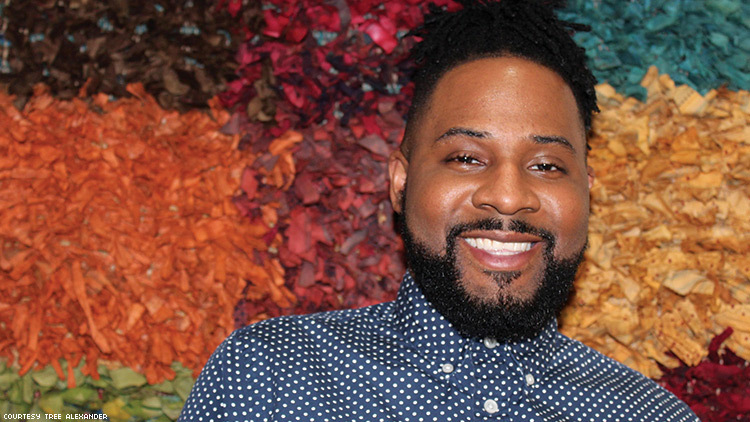 Growing up on the south side of Chicago, Alexander says his education about HIV was minimal. “It was like a TV thing, not in real life,” he says. But after he came out as sexually fluid to his family and moved in with a boyfriend at 17, HIV became very real. A year later, his boyfriend became ill, but resisted seeing a doctor. “I went across the street and got tested at the clinic,” Alexander says. This was before rapid testing was available, so he had to wait two weeks for results, which eventually came back positive. At first, he didn’t tell his family. His boyfriend was already showing visible improvement from the meds he was given at the hospital. But Alexander was refused treatment. At the time, only those whose T cells were under 500 were given medicine. He didn’t qualify. “So I found a research study in New York that was able to start [me] on early intervention medication, which prompted me to move,” he says. He had started his soap business, but gave it up and used that money to move to N.Y.C. When he landed in the Big Apple, he had a mission but no money. “I slept on the trains and the parks for about three months, before I was able to get into a youth shelter” he recalls. The shelter ended up being a nunnery in the West Village. Alexander ended up with a job as a care coordinator at Housing Works, a non-profit that fights HIV and homelessness. He later joined the Brooklyn AIDS Task Force (now called Bridging Access to Care) as a coordinator and social change activist. Now, Zambo Aroma offers a variety of handmade specialties, including herb-infused soaps, lotions, body butters, and bath bombs. Of course, Zambo is more than just a soap store. He says the key is consistency, too, something he tells those who are newly diagnosed HIV-positive.